John Robert Miner was born on Dec. 2, 1895 in York Township, Carroll County, IL, or in Thompson Township, Jo Daviess County, IL, the son of Daniel Lucas and Mary Elizabeth (Hodges) Minerd. He was a veteran of World War I. As a boy, John moved with his parents and siblings to Missouri, and thence to Iowa. Upon reaching adulthood, he apparently relocated to New Orleans, Orleans Parish, LA. John served with the US military in World War I. In September 1917, he took basic training at Fort Douglas, UT, but it is not known if he went overseas. His parents sent a postcard to relatives back in Uniontown, Fayette County, PA, showing him in uniform, and adding that three of his brothers were at risk of being drafted. Upon returning home, on July 23, 1920, at the age of 24, he married 20-year-old Heloise Estelle Foley (May 16, 1899-1997), a New Orleans native and the daughter of William Boylan and Heloise (Freret) Foley. They had four children -- John Robert Miner Jr., Carolyn Miner, Heloise "Cookie" Mayeux and Annette "Nettie" Dean. John was employed as a mechanic at a New Orleans laundry in 1930. Then, in 1940, he worked as an automobile mechanic for the U.S. Army Corps of Engineers. The federal census of 1940 shows the family residing in New Orleans, with Heloise's widowed mother Heloise Foley, 67-year-old unmarried aunt Ceclie Freret and nine-year-old granddaughter Helene Birstin (?) residing under their roof. John married again, at the age of 54, to Irene Margaret Kelley (1895-1981), on Oct. 21, 1949 in Mena, Polk County, AR. She was also a New Orleans native, and the daughter of Michael and Isabelle (Eickhorn) Kelley. John and Irene had no children of their own, but apparently he returned with her to the New Orleans area. Irene outlived John by nine years, and succumbed on July 13, 1981, in Metaire. Son John Robert Miner Jr. (1922-1996) was born in 1922 in New Orleans. He married Gloria Ricard ( ? - ? ). They lived in Gretna near New Orleans and produced these children -- Wayne C. Miner, Karen M. Cox and Beverly Canatella. During World War II, John served as a petty officer in the U.S. Navy. He was a graduate of Tulane University and went on to a longtime career as a traffic manager for Delta Petroleum Company. John passed away in the West Jefferson Medical Center in January 1996 at the age of 73. A New Orleans Times-Picayune obituary said he was survived by six grandchildren. Interment was in Lake Lawn Park Cemetery and Mausoleum. Son Wayne C. Miner wedded Cathy Green. They have one known daughter, Madison Miner. In 2017, they submitted a selfie for the annual Minerd-Minard-Miner-Minor Reunion webpage. Daughter Carolyn "Carol" Miner (1924- ? ) was born in 1924 in New Orleans. More will be added here when learned. Daughter Heloise Miner (1925-2013) was born on July 22, 1925 in New Orleans. She was joined in matrimony with Justin Donald "Don" Mayeux (Aug. 12, 1925-2014), son of Lumay Joseph and Barbara (Herty) Mayeux. Their marriage lasted for 67 years until the separation of death. The couple made their home in Diamondhead, Hancock County, MS and produced four sons -- Richard "Rick" Mayeux, Rusty Mayeux, Phillip Mayeux and James "Jim" Mayeux. Said the New Orleans Times-Picayune, Heloise was "a loving mother and homemaker who enjoyed bowling, tennis and golfing with Don and their friends at Diamondhead." Justin worked in the field of insurance and owned his own agency, Mayeux and Associates, Inc. 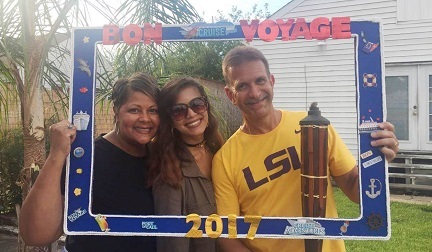 In his free time, he was passionate about watching Louisiana State University Tigers football and reveled in LSU's three national championships over the years (1958, 2003 and 2007). Justin only survived his bride by a little more than a year. He joined her in death on Nov. 8, 2014 at the age of 89. Son Richard Kenneth "Rick" Mayeux (1953-2009) was born on March 9, 1953 in New Orleans. He married Maelena Morley Bouchon (April 28, 1959-2012), and they were the parents of Emily Bouchon Bradford. Reported a newspaper, after attending the University of New Orleans, Rick's passion for sports led him to be a statistician for UNO Sports for more than 25 years. He was also an officer of Mayeux and Associates, Inc. Insurance Agency." Sadly, Rick died at home in New Orleans at the age of 55 on Jan. 26, 2009. Interment was in Lake Lawn Park Cemetery and Mausoleum. Maelena lived for almost four years as a widow. She passed on Nov. 6, 2012 in Harahan, Jefferson Parish, LA. The inscription on their grave in the Garden of Tranquility reads "Love is Stronger than death." Granddaughter Emily Bouchon Mayeux married Don C. Bradford. Son Stanley John "Russ" or "Rusty" Mayeux (1947-2015) was born on April 3, 1947 in New Orleans. He studied at the University of New Orleans but was a fan of the Louisiana State University Tigers and also the New Orleans Saints of the National Football League. Said a newspaper, "He had a creative passion for art and loved spending time with his children, grandchildren and family. He enjoyed the outdoors, movies, his grandchildrens’ activities and especially attending Bible studies." In 1969-1970, he served for 13 months with the U.S. Air Force in Korea's Demilitarized Zone. Added the newspaper, "His field of training was in communications. After his military service he worked with the family’s insurance business before going on to form his own successful business in sales and advertising." Stanley had five children -- Angelle Mayeux, Don Mayeux, A.J. Mayeux, Ezekiel "Zeke" Mayeux and Isaiah "Zaya" Mayeux. He also had two stepdaughters, Christina and Tanya. Sadly, he died in New Orleans on Jan. 25, 2015. Interment was in Lake Lawn Park Cemetery and Mausoleum. Son Phillip Mayeux wedded Laurel. Daughter Annette "Nettie" Miner (1928- ? ) was born in 1928 in New Orleans. She was united in wedlock with Richard "Rick" Dean. More will be added to this biography when learned. For information on the Hodges family genealogy, please contact Sharon Hodge-Spencer, who has freely shared her research findings with us.